Note reading struggles are something that teachers commonly equate with young piano students. But the truth is, many kids will struggle with note reading into their tweens and teens. Note reading struggles are more frustrating for older students than they are for younger students. When kids are young, games are usually employed to take the sting out of note reading. But as kids get older and teachers play fewer games, learning new notes (like ledger line notes) becomes more frustrating and less fun. 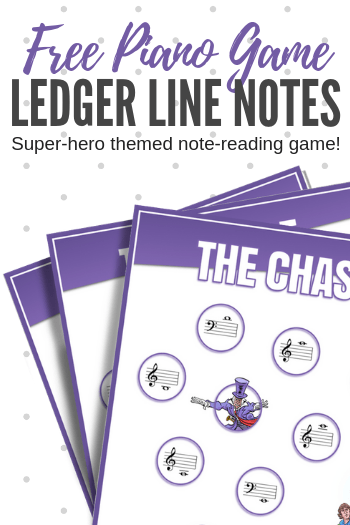 So today, to put the fun back into note reading, we are sharing a ledger line printable that will thrill your teens and tweens! Today’s game reinforces visual recognition of ledger line notes. 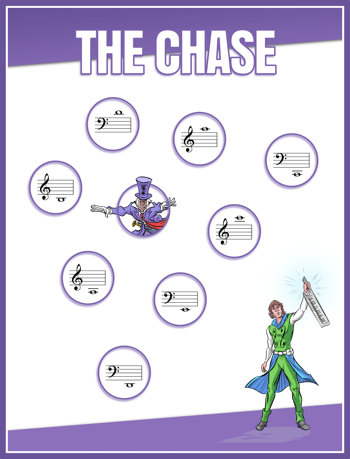 While great as a standalone activity it has been themed to correlate with our NEW tween piano book series, The Adventures Of Fearless Fortissimo (learn more about these books here). The Chase is based after an Easter game we created last March. The game is best explained with a video. So, download the printable here or click on the image and then watch the video to learn how to play. instead of the Easter printable you will be using the printable found here. Unlike the Easter printable which contains images of intervals, today’s printable contains images of ledger line notes. Instead of labelling each egg with an interval name, you are going to want to label each egg with one of the following ledger line notes: A, A, B, C, C, D, D, E.
To correlate with The Adventures Of Fearless Fortissimo, use only eggs that are green and white. This isn’t really necessary… but it looks cool! The Adventures of Fearless Fortissimo is the Bam, the Zzzwap, and the Kapow for teaching children who crave action to love piano lessons! Each book in the collection turns original piano pieces into the backdrop for a thrilling comic adventure. You can listen to some samples from all three episodes below. If you like what you hear, you can buy them here on Amazon.